Losing your teeth can be a serious problem to your health, your appearance, and your oral hygiene. When you think about getting implant versus dentures, you have to think about replacement costs, your convenience, your overall health, and how long it will take to get the chosen solution. Still, it can get confusing no matter what you are planning to do because there are just so many overwhelming details. Your restoration options include, but aren’t limited to, dentures and dental implants – but which is the best? What are Removable Complete & Partial Dentures ? What Are the Benefits and Drawbacks of Dentures versus Implants? 1. How much are Dentures ? 2. How much are Dental Implants ? Making a Decision: Dental Implants or Dentures? False teeth dentures are used to replace missing teeth and they can also replace the appearance of missing gum tissue. They are removable, and come in full or partial dentures. Full dentures (also known as complete) replace all of the teeth on you upper or lower jaw. So you can get top dentures, bottom dentures or both. Partial dentures also called dental partials are instead used to fill in the gaps where you are missing natural teeth. Full dentures rest directly on your gums; but partial dentures are supported by the existing teeth, with clasps or precision attachments that are specially fitted. Dentures also have a gum-colored acrylic base that helps to support them. Some will also include a metal framework if your dentist thinks you need the extra support. You can also have what we call implant supported dentures : check the technique below called the all-on 4. It is a combination of implants with dentures. Dental implants are titanium posts that are surgically inserted into the jawbone. They act to replicate the natural root of your tooth. Once the post bonds to your jawbone like a normal tooth would, it can then be used as an anchor to hold a replacement tooth or a crown. This method can be used to replace multiple teeth or a single tooth. It can even be used for your whole mouth – which means a few more implants to set up. Replacement teeth will look natural as dentures teeth come in many different sizes, shapes, and shades that you can mimic your own natural teeth. The pink acrylic material used to mimic your gum can also be matched to your natural color. Dentures are more affordable for many people, especially if you have many teeth to replace. the procedure ony takes weeks whereas it takes 3-6 months for implants. The process in non-invasive and doesn’t involve any surgeries, so it is not as painful as for implants. Easy to adjust and any modifications that you need with your dentures can happen quickly and painlessly. Helps to reshape your face as your cheeks and lips are supported. Because, tooth loss leading to cheeks and lips being less supported, can make your face look like it has collapsed inwards. The appearance isn’t quite as natural since you can sometimes see the acrylic gums instead of gum tissue. They need to be cleaned regularly, which means that you need to remove them nightly to let your gums rest. You can’t wear them at night so your gum tissue has time to recover. They tend to move while eating sticky and harder foods. Denture adhesive is messy and expensive and often doesn’t work. Dentures are very fragile and can break if you drop them. Food can get trapped in between the dentures and the teeth, which can hurt. It can also lead to gum disease and tooth decay in your remaining teeth. Some people mentally cannot handle wearing removable dentures and prefer a permanent solution. Partial dentures may weaken your natural teeth that support them which means these teeth might need to be reshaped accordingly to keep the whole system tight. Insurance Options: Dentures will likely be covered by your dental insurance, sometimes falling between 15% and 50% of your total cost. Implants, however, are considered to be a cosmetic procedure so they aren’t covered. But we are seeing more and more new plans that cover a portion of implants so check with your insurance. Durability: Implants that are well cared for and cleaned will last for quite a few years, perhaps even for life. Dentures, however, will need to be replaced more often. You might want to do some math here to see what the better choice is. Oral Health: Implants help to keep your bone and gum tissue health because they stimulate them by transmitting direct pressure forces to the bone when you chew. This reduces your risk of losing teeth. Dentures don’t do this, and sometimes they can start to become ill fitted which can accelerate bone loss by placing too much pressure on your gums. Oral Hygiene: Dentures have to be cleaned meticulously at night – you’ve seen the cartoons of the dentures by the bed. Implants, however, can be cleaned the same way you are doing it now: brushing and flossing. Appearances: Implants look far more natural and they feel natural as well, which is a tipping point for many people. Dentures can feel large and bulky. Dentures can also slip as you wear them because they start to stretch out. Food: Eating is easier with implants and you will be able to eat almost whatever you want. If you have partial upper dentures, you may be frustrated because your upper palate, which has a ton of taste buds, is completely covered by a plastic thing. Protection: Implants will help prevent the rest of your teeth from moving out and they won’t need to be modified in any way. With dentures, you sometimes have to get your teeth modified or shaved down, which weakens them forever. What you will pay for dentures varies according to a few different thing, mainly where you live and the quality of dentures that you get. You can purchase cheaper dentures, but you must remember that you will get what you pay for. Higher quality dentures use the best materials and techniques so that the aesthetic and mechanical parts work well – they will last longer, look more natural, and feel better. You might even be able to get a warranty, depending on the brand. Basic dentures for one arch of teeth cost anywhere between $300 and $500. For a complete set of both upper and lower teeth, it will come in between $600 and $1,000. For this price you will get a limited warranty for a pre-set size. Basic dentures typically won’t last as long. For mid-range dentures, it will cost between $400 and $1,500 for an arch. A complete set will cost you around $800 to $3,000, depending. You will likely get a 1-2 year warranty and get some personalization. Partial dentures that are removable start at $200 to $500. However, they average at $700 to $1,500 for better quality dental partials. If you want to get metal framework for the support, you may have to pay a total of $1k to $2k or more. Of course, keep in mind prices will vary depending on the number of teeth to replace. Dental implants cost more than dentures, but the exact price depends on your dentist and his/her experience and popularity. It can also vary depending on your heath, location and the procedure itself. The materials you need to make the implant and the other tests that you might need add to the overall costs. Additional procedures like a sinus lift or a bone graft can also raise the price. Other things that can raise or lower your cost include the number of teeth you need to replace and whether you need all implants or you can get a bridge that is supported by 2-4 implants. A single tooth implant will cost between $1k and $6k to be placed by a dentist. The implant abutment and crown are on top of that, and can add an additional $600 to $3k, depending on materials as there are many different types of implants. The average cost is somewhere around $4,200, but you will need to consult your dentist for your own estimate. Getting more than one implant depends on how many you need, but can run anywhere from $3,000 to $14k or more. 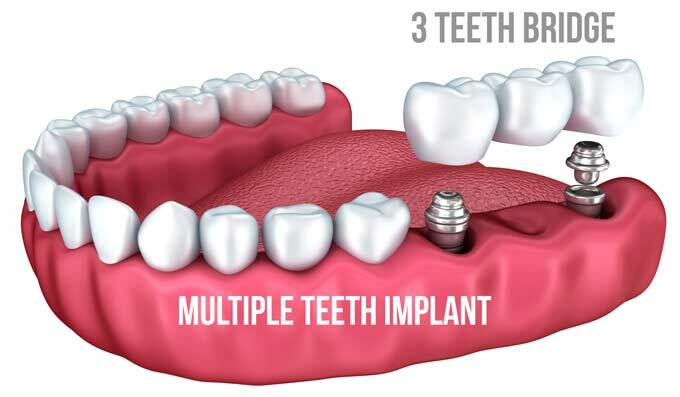 Two implants can support a dental bridge with three or four teeth. This will cost around $6,500 and $7,500. If you want to replace your lower and upper dentures with an implant supported denture system or with a fixed bridge, you can expect to pay a pretty penny – $34k to $80k with an average cost of $50k. This is a lot of money, but it may be worth it if you have a lot of teeth to replace and require multiple implants. Check also our article with 10 ways to get cheaper implants. Yet, there is a way to get an implant supported denture that is cheaper : by reducing the number of implants needed to anchor each arch. that is where All-on-4s shine. And as we told you it is a way to combine the assets of implants with dentures. 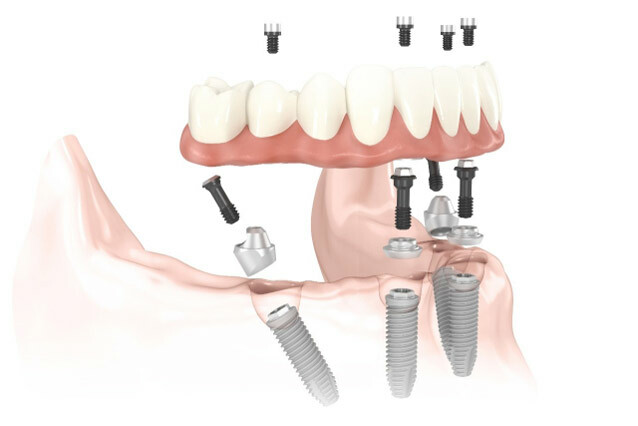 The All on 4 technique is used so that an upper or lower denture is replaced with a fixed denture that is supported by four implants. This technique is a little complicated, and is based on the angle of the implants: the two at the front are places at a 90° angle and the two on the sides are tilted toward the back at 45°. They do this because it maximizes the amount of bone that can hold the denture in place. This is a complicated process that takes a lot of training and planning. If you want to read more about this all-on-4 method, click here. Dental implants are the best choice for almost everyone, because by replicating natural tooth roots, they look and feel a lot more natural than any of the other options that you have. They also preserve your gums, jawbone, and the rest of your teeth. There may be some complications but they are less and less common with current implant technology. Dentures can be a lot trickier, limit your food options, and need to be replaced more often. However, there are sometimes people who would be better off with dentures. Simply put, implants don’t work for everyone. If you have a grinding problem, you don’t like surgery, you smoke and won’t quit, or you have certain diseases like diabetes or other immune system compromising diseases, dentures are likely the answer. They are also a great short term option if you cannot afford implants. At the end of the day, the decision needs to be made by you, but should also include a discussion with your dentist or oral surgeon.